The BUPA Great South has a huge field, 25,000 for what is classed as the “World’s Premier 10 Mile Event.” It is a gold something-something event, I can’t remember what was said by the announcer over the PA, or maybe it was the wind howling at Portsmouth seafront. For all my American readers, it is here. Celebrities run it, some old guy from Coronation Street or Emerdale ran it, the ginger 400 metre runner Euan something ran it, the women’s winner of the Berlin Marathon (Noooooo!) ran it. It is something of a big deal, but to me, it just didn’t feel like it. Maybe I am spoiled being from and running in London, but the World’s Premier 10 Mile event seemed to be missing something to make it truly special. The weekend was full of events, with a 1.5K kiddies race and a 5K the day before the big race itself. Portsmouth, like a lot of coastal towns is full of B&Bs and hotels that have a 2 night minimum stay policy, so it was a pain in the ball to find somewhere and I ended up going down Friday and staying at the IBIS hotel. This allowed me to scout out the route from the hotel to the start line for Sunday, as well as enjoy a wonderful evening of hoppy wet dog smelling alcohol at the Brewhouse and Kitchen. The race started and finished by the water. 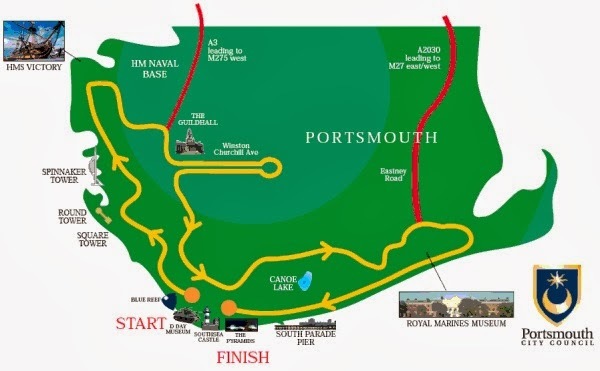 It was to run up into the historic dockyard, through the active naval dockyard (something no one has done before) running along by my hotel (twice), down to the seafront, before turning into the wind toward the finish. And, as I said, we did run through the historic dockyard, and were the first people to be allowed in the active Naval base. But my run did not start well. The clocks went back the night before so I was up an hour early. 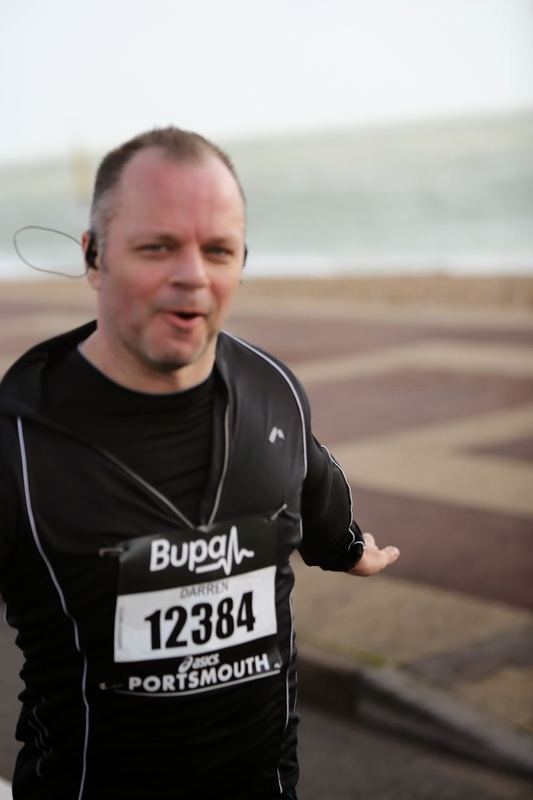 This gave me an extra hour to eat and drink before I started down to the start line. 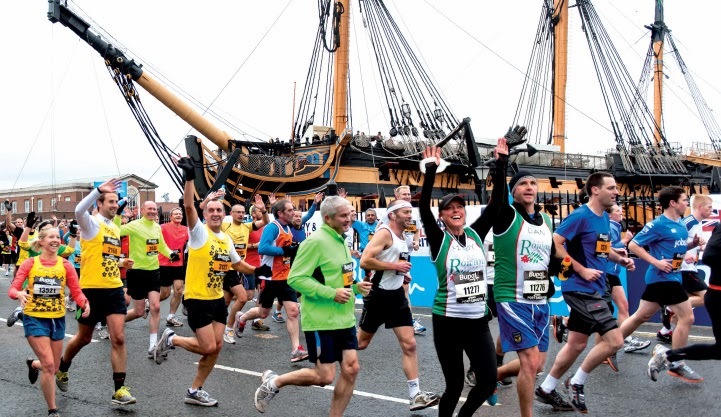 The race was also taking place just as the largest storm to hit the UK for 25 years was due. Look for Tweets with the hash tag #stormageddon. So a lot of the tents, and the flags for the area where family and friends were supposed to meet you after the race were not put up. The race also started at 10:48 for my corral. I mean, really? Why wait until 10:15 for the pros? 9.30 is normal for all other races. Anyway, having been up since 7, 10:48 meant my bladder was full to bursting, but I was crammed in like sardines with my fellow runners. So I could not make it to the porta-potties before the start before the klaxon sounded. 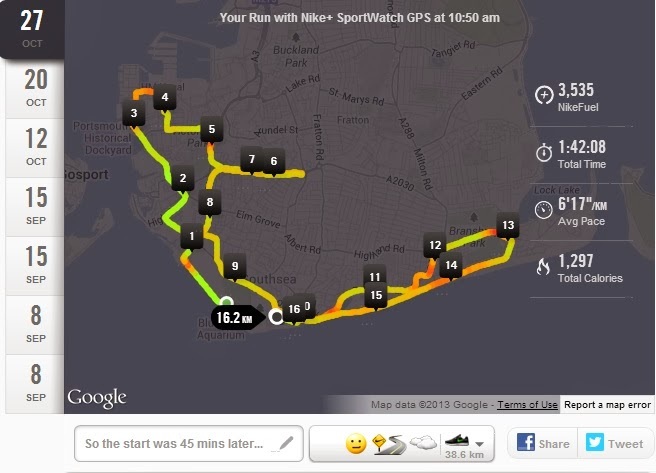 The red dot near the start was me, and many others, finding relief at one of the toilets by the water front. The potty break did throw my pace off, and, as we ran into the historic dockyard, I ended up with debilitating shin splints after 3K that meant I had to stop and walk a bit before finding myself, taking off a shoe as I had pins and needles, and then running the rest off the bat, ending, as I did, very strongly, and then running back to the hotel to shower, change, and catch a train back to London FULL of fellow runners. Here is a treasure, running comfortably along at 9 miles, howling wind in my face, arms out. 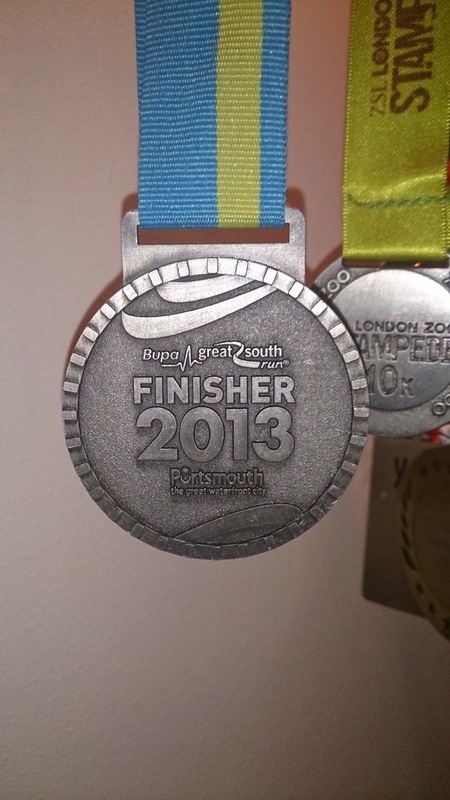 Next year is the 25th anniversary of the Great South Run, so maybe the bling will be special, but this year it was standard BUPA fare. Would I run it again? No, not at all. I have run better 10Ks and Halves. 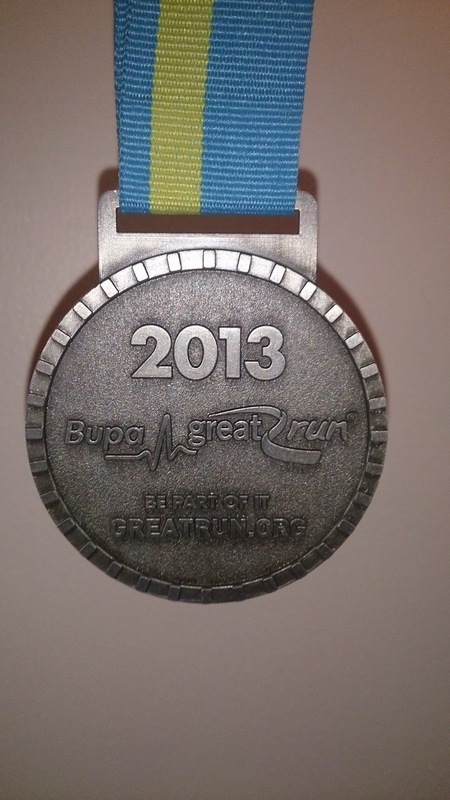 I do like the BUPA organisation of their races. But this was nothing special. Would I recommend it? Probably not. I had much more fun at the Royal Parks Half, at the London 10K. 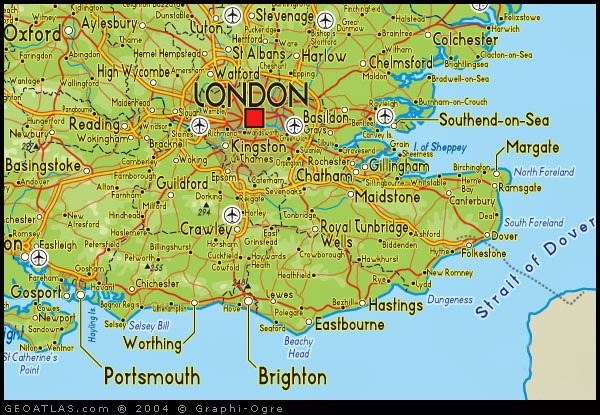 Brighton and Bournemouth get better reviews. This was just a famous race. Goodness knows why? Tradition maybe.